Transcentral European & UK Ad-Hoc Courier Service providing same day and next day delivery services as well as scheduled runs. Large fleet of suitable vehicles is matched to your delivery requirements from vans to large lorries we have the vehicle you require. 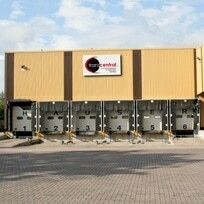 Warehouse storage facilities at Manchester and West Midlands. 24 hour courier company servicing all of the UK with urgent same day deliveries. Medical Courier – For pathology, X-Ray and bio medicine. Other services include hazardous and fragile goods. For more information visit our website.